The Mystery of History (MOH) is a complete, chronological history curriculum for grades K through high school. It offers kids a picture of what is taking place all over the world during different time periods of history. When you combine MOH with WonderMaps, you can easily integrate geography into your history lessons. 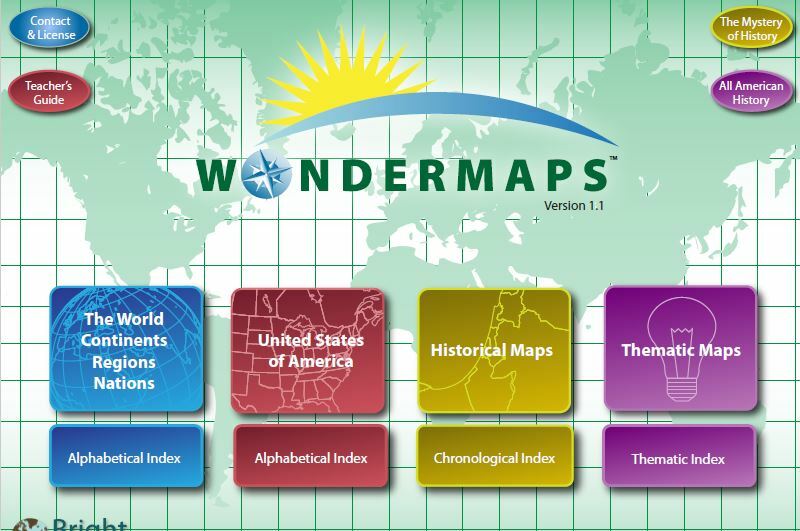 WonderMaps is a downloadable software that contains USA maps, world maps, and historical maps that you can customize. It also contains the complete set of maps for The Mystery of History vols. I–IV and All American History vols. I & II. My favorite reason for using WonderMaps for The Mystery of History is how easy it makes printing your maps. Although the maps are included in the back of each volume of MOH, it can be cumbersome and time consuming to copy and print them. WonderMaps allows you to print exactly what you need by a click of the mouse. Once the program is installed and launched, you see this screen. Look for the gold button titled The Mystery of History in the upper right hand corner. The next page takes you to the map guide. The map guide lists each lesson along with its accompanying maps. If you are reading about Ancient Egypt, you can click on a map of Ancient Egypt to show to your students. Or if you are reading about Abraham, you can click on a map showing Abraham’s journeys. Another wonderful feature of WonderMaps is the ability to customize your map. For example, maps can be printed in color or in black and white. They can include continent and ocean labels, or you can leave those off. You can choose to add borders, country names, rivers, river names, graticules, and graticule labels. All of these options can be added or taken away with the click of your mouse. Below you can see a side by side comparison of the different options you have on a single map. You can take away everything except country borders or you can include full color and continent names. There are dozens of different customization combinations you can select. Here is an outline world map, labeled and colored by a child. At the bottom of the page you can click on maps from the book which will take you to a list of the outline maps and the answer keys. These are the maps that are assigned at the end of each week in the SomeWHERE in Time section of The Mystery of History. An Outline Maps page is shown telling you how many maps you need for each age group of each map in the collection. All you need to do is click and print. You can also print out the answer keys if you would like or simply check them from your computer. Here is a sample map with the ancient cities of Babylon and Nineveh labeled by a student. 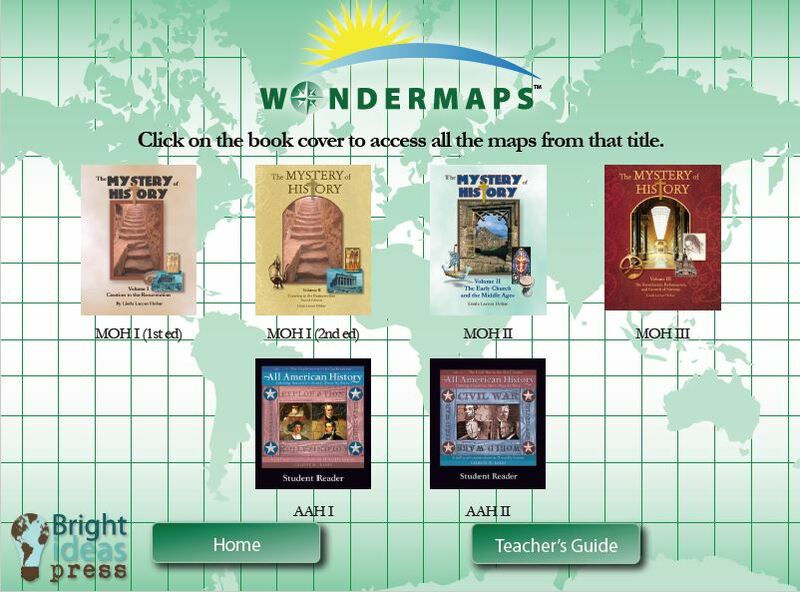 WonderMaps makes mapping The Mystery of History lessons quick and easy! Mama of 7 children -- 4 boys and 3 girls. My oldest daughter has graduated, and I am happily homeschooling pre-school through 8th grade. You can follow along with my homeschool journey at The Happy Homeschool Mom where I also share homeschool encouragement, product reviews, and recipes. Find me on Twitter @lthomeschoolmom.